Professional grade, easy-to-use karaoke machine rentals. Featuring an internet-ready iPad configured to access over 13,000 karaoke songs online and 4,000+ songs on the iPad itself. 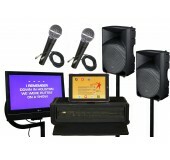 Check out our Karaoke Machine Rental page for more information on our fantastic wifi-based Karaoke Machines. 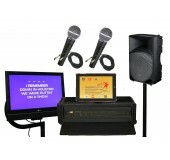 iPad-based, easy-to-setup professional karaoke system rental. 10,000 + songs updated monthly for guaranteed karaoke party fun! Add a second speaker to our complete karaoke sound system for great sounding karaoke in a large space.